Jonathan Grotenstein and Storms Reback’s latest book titled SHIP IT HOLLA BALLAS! 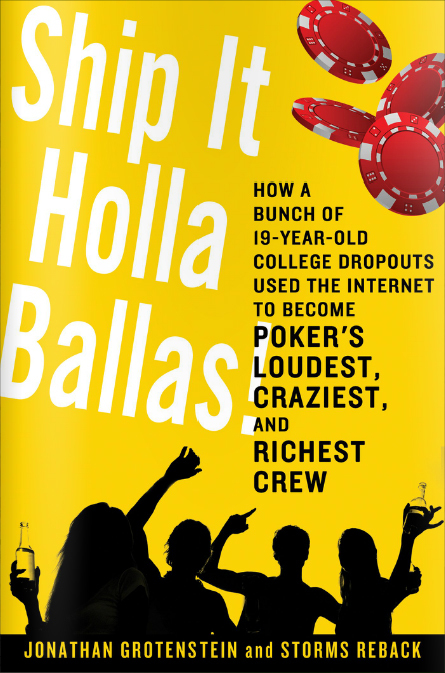 : How a Bunch of 19-Year-Old College Dropouts Used the Internet to Become Poker’s Loudest, Craziest, and Richest Crew, details the story of arguably the most infamous poker crew from before Black Friday. "The loud narcissism and adolescent degeneracy of these talented 'ballas' ain't pretty, but the testosterroneous world of high-stakes online poker in America before Black Friday, in all its doomed glory, steadily throbs in Grotenstein and Reback's swift prose." Team PokerStars Pro Dusty Schmidt has announced to be releasing a new book, titled ‘Don’t Listen To Phil Hellmuth: Correcting The 50 Worst Pieces of Poker Advice You’ve Ever Heard'. Dusty ‘Leatherass’ Schmidt is known for his huge online winnings and unconventional views on poker. Having played more than 9 million hands online, Dusty has won almost $4 million during his five-year career. He has 66 consecutive winning months behind him, without ever having had to experience a losing one. He is co-authoring this book with fellow pro Paul Christopher Hoppe, and promises to provide completely original poker education, correcting some of the biggest mistakes made in the history of poker tutoring. Phil Hellmuth, everyone's favourite bad beat bad boy released a new series of books entitled "Phil Hellmuth’s Legendary Poker Hands". The series consists of 5 separate eBooks released only at Apple's iBookstore for $2.99 each. The series contains 5 chapters sold as 5 distinctive books each with 22+ pages of hand histories and analyses by Phil. The volumes are entitled the following: Phil on Pocket Pairs, Phil Bluffs and Gets Bluffed, Hellmuth vs. Chan, Phil’s Great WSOP Hands and Phil Loses 5 Hands…And Lives and Learns. The following list consists of arguably the best books on poker available on the market. I encourage you to challenge my list, and suggest something else if you have another favourite; nevertheless, keep in mind that these discuss the theoretical foundations of the game, in most cases especially for beginners. This is rather a entertaining one, revealing his way of thinking during the different hands of a tournament. It admittedly made play more difficult for Hansen for a while as many of his adversaries took advantage of this knowledge against him. David ’Devilfish’ Ulliott’s long anticipated autobiography, ’Devilfish: The Life & Times of a Poker Legend’, is available from 9 September and can now be pre-ordered through Amazon.co.uk for £9,09. Probably one of the most interesting is the life of Ulliott among the poker legends, as it spans from crime years with the petty lowlifes of the dark alleys of Kingston upon Hull to the rise to his single-to-date WSOP bracelet and winnings of approximately $6 million in total. Super System, written by Doyle Brunson, the grandfather of poker, would have to be as important to poker as the first television broadcast was for TV. 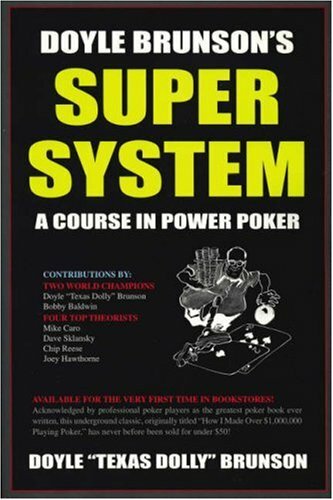 Super System is nothing else than a milestone and, in short, it is the Bible of Poker. Super System was published in 1979 by Cardoza Publishing. At this time, Doyle Brunson already held the title of two-times WSOP Main Event winner (1976 and 1977). The original title of the book was ’How I Made Over $1,000,000 Playing Poker’. Of course, a lot of years have passed since 1979 and the book still had relevance to today’s gameplay, but after heavy thoughts, they decided it was best to rewrite it and give it a fresh new title ’Super System 2’, publishing it in October 2004. This is a really a book not to pass by. Because Barry Greenstein’s book is one of my all-time favorites, I think I’m gonna be a bit biased when it comes to this review. Why is this? Because it was a pleasure to read, well-structured and left me wanting more. I think everyone can take away something from this book, I found all the chapters very useful and all the pages are worth looking over twice. This might not be the most convincing argument for the book, but the quality of the paper it’s published in and its high quality photos (284 of them!) not only make it a pleasure for your eyes, but also a valued book in your collection. 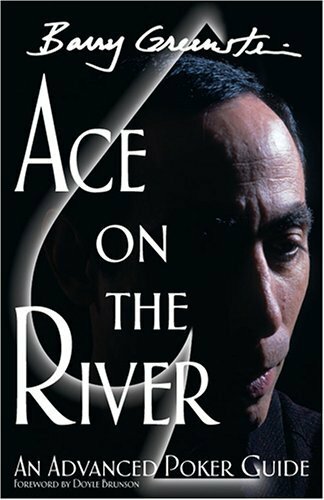 Another reason behind my favoritism towards this book would have to be my respect for Barry Greenstein as both a professional poker player and a personality. I feel there is a lot to learn from him and his gameplay is simply amazing. The author of the book did not pick up the nickname ’The Robin Hood of Poker’ accidentally, as for he has donated millions of dollars of his winnings to numerous charities. Greenstein doesn’t only have his hands in tournaments, but he also plays cash game and has appeared numerous times in the American show High Stakes Poker, aired by the GSN Network. 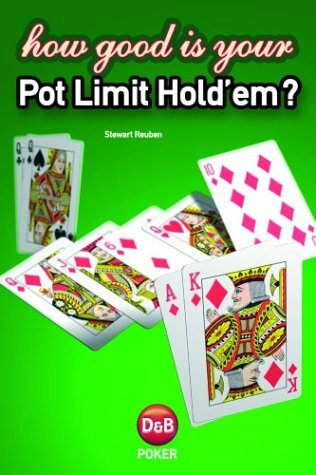 Stewart Reuben – How Good Is Your Pot-Limit Hold’em? Players’ choice: a must for every poker player to read. This book, written by Reuben in 2004, gives us readers a glimpse into some fascinating hands played by the author in the London Victoria Casino, the Birmingham Rainbow Casino and Las Vegas. I personally would like to commend the book’s layout and the knowledge it has given me. The main concept within this book is that the author collected his most memorable and heavily disputed hands with a detailed analysis on each.